Late last year Toby HK released his neat 2013 ‘Please Let Me Stand on Your Desk Every Month’ calendar featuring one build-it-yourself paper toy for each month of the year. Now, free from their scheduling duties, his characters are really ready to shine. 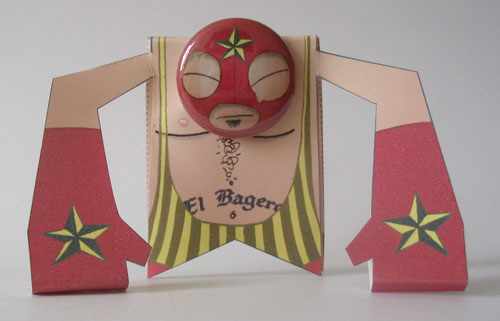 ‘Please Let Me Position on Your Table’ is a new paper toy series featuring 12 new designs and four artist crossovers with Touma and Lazy Burger. The new series will debut this summer at Taipei Toy Festival 2013. 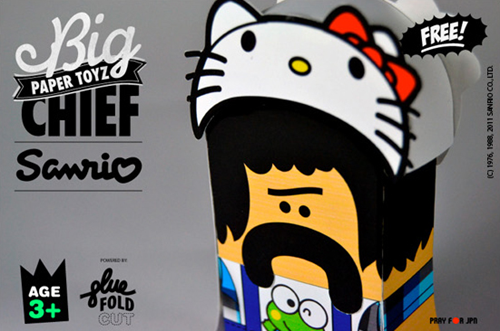 Big Chief Paper Toyz is working alongside Sanrio, to release a new collaborative paper creation. Luca Gentile designed Big Chief with a Hello Kitty hat and a Keroppi T-shirt. You can download your very own template for FREE HERE. This release also signifies their support towards the recent tragedies n Japan, as well as their efforts to help send their prayers to everyone in need. 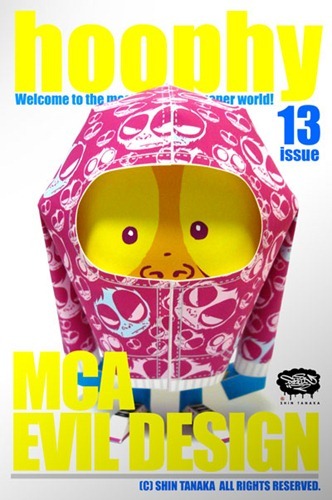 Shin Tanaka has just released the newest Hoophy paper toy- #13 designed by MCA (Evil Design). Featuring MCA’s signature evil ape, Hoophy #13 is available for free download now. Print it out and build it. While you’re at it, why not ‘buy’ the previous dozen as well? Designer toys on the cheap, just what the doctor ordered. Matthew Hawkins created this awesome double sided exclusive paper figure for the upcoming ‘Rock, Paper Scissors’ show, which he co-curated with Rivet Gallery. The show takes place this Saturday, January 2nd from 7-10PM. Exhibited will be 75 paper sculptures by tons of artists from around the world. 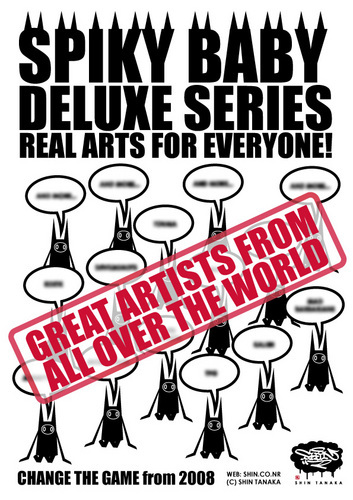 Artists include: 3EyedBear, Kenn Munk, Ben The Illustrator, BigChief Design, Shin Tanaka, Atelier Alessio Blanco, Carlo Giovani, e440, Jerome, Nicebunny, Illectronics, Horrorwood, Sjors Trimbach, Christopher Bonnette, Jonny Chiba, Rememberthelittleguy, mckibillo, mck, PHIL, LouLou, Bryan Rollins, Marshall Alexander, Dolly Oblong, Paper Foldables, Harlancore, Cubotoy, Tetsuya Watabe, Nick Knite, and of course Matt Hawkins. For more info on all of these artists, check out their bios HERE. 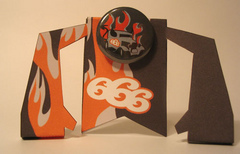 Also available at the show will be posters, paper toy kits, and an appearance by Matt Hawkins. Feel free to also check out the D.I.Y. paper station! 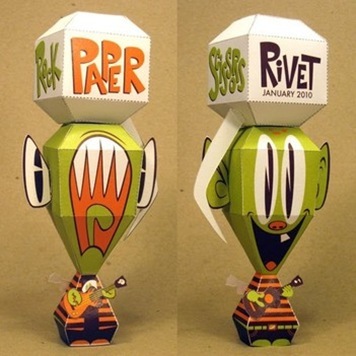 Download the exclusive Rivet ‘Rock, Paper, Scissors’ paper toy HERE. 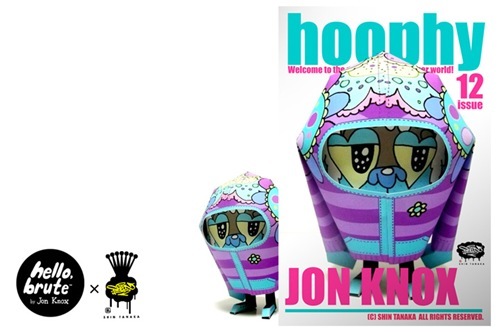 Hello Brute (Jon Knox) has teamed up with Shin Tanaka for an excellent Hoophy paper toy release(#12) for December. The facial expression peering out from the hoody works really well – very evocative. As with all of Shin’s paper toys, this one is free for the download. So go get it, print it out and build it. While you’re at it check out the other 11 previous designs including figures from Jon Burgerman, Dave Flores, Koa, Skwak David Horvath and more. 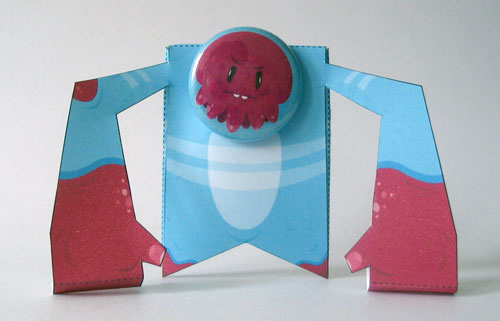 Chicago Artist Travis Lampe is the latest guest artist to rock Shin Tanaka’s Hoophy Paper Toy platform. Available for download now for the low, low price of free. In the world of paper toys, Shina Tanaka is a cut above with numerous original designs + the vision to feature artists with a platform approach. Grab this latest artist edition and spend some time on his site to take in his serious creative output. Phoneticontrol brings the Thought Processor to the city of angels for the LA Series event on Thursday September 3rd, 2009 @ Munky King. 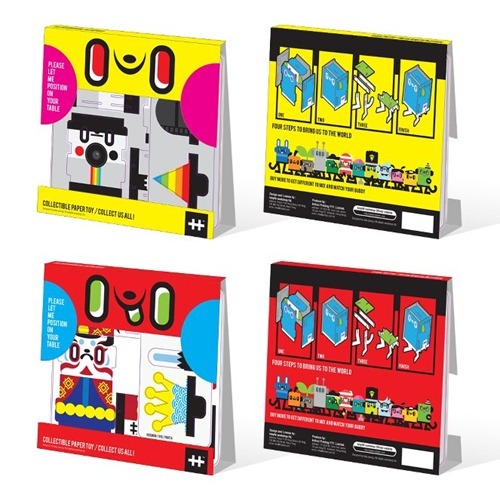 Fresh off the success of the SF series, Phoneticontrol has invited LA artists to create a design for the Thought Processor paper toy, a collaboration between Phoneticontrol and paper master Sjors Trimbach. The art show will feature a 200% Thought Processor and an original 2D piece from each artist. After the show, all of the LA Series Thought Processor designs will be available for download – ready to be printed, cut, and assembled. The LA Series lineup includes 14bolt, Aaron Kraten, Angry Woebots, Branded, Bob Motown, Chris Battle, Dave Chung, Enik, Erik Siador, Gordon Hammond, Chris Moreno, Jawa, Jim Mahfood, Martin Hsu, Matt Linares, Michael C. Hsiung, Plex, Robert Ryan Cory, Two Rabbits,and Zoso. 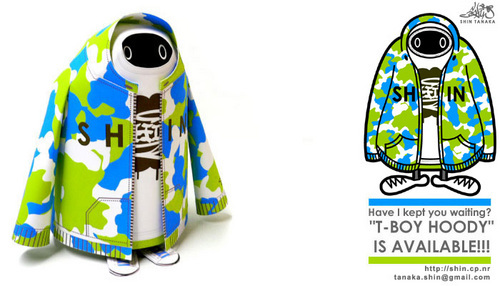 Hit the jump for previews of pieces from Jawa and Michael C. Hsiung. 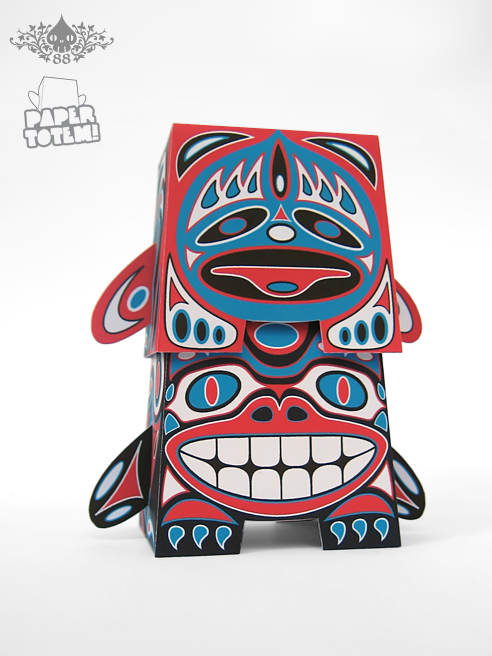 Dolly Oblong came up with paper totem figures, which stack on top of each other and are interchangeable. Dolly has worked with tons of different artists and she features a ton on her website. Reactor88 takes up the paper concept and adds his own totem touch to these free printable figures. You can download his template HERE and feel free to browse Dolly Oblong’s site for all of the other designs. The newest Hoophy collaboration has landed. This time around French madman Koa takes on Shin Tanaka’s paper figure. Go download and build it right now. Free, as always. Good news paper fiends. Phoneticontrol of PFOM has teamed up with Shin Tanaka on the multi-eyed Hoophy #7. And the best part… it’s free – as always. Download it and build it today. 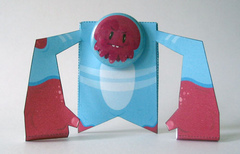 Hawaiian artist Mycryptonauts, part of the Pocket Full of Monsters, is best known for his sweet hand-sewn designer plush. 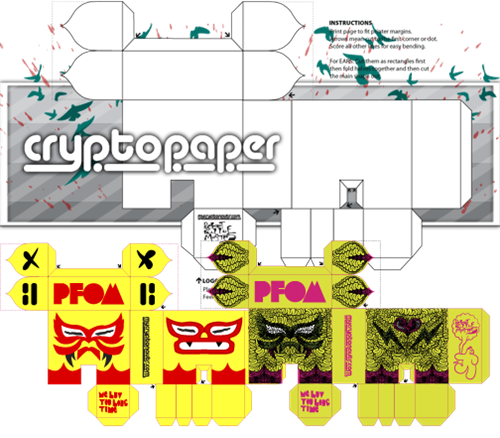 He created Crypto-paper, a paper toy patterned after his plush shapes, as a way of interacting with designers and artists across the globe. He’s currently running a Battle Royale contest – download the blank template, put your design on it, build it and send a photo info[at]mycryptonauts[dot]com. The best design will win a one-of-a-kind hand sewn Cryptonaut plush. 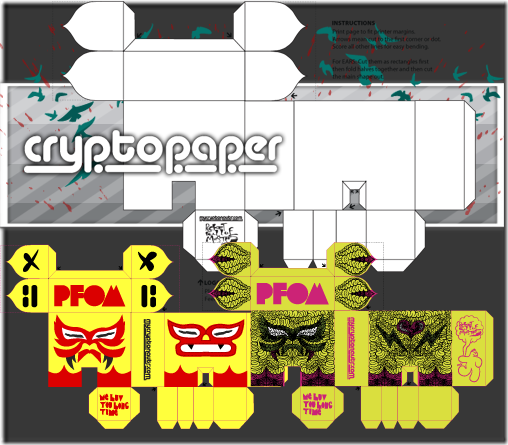 If you’d rather just download and print out a sweet ready-to-build toy, Mycryptonauts has you covered too – download Mind Full of Guts and 2Face. 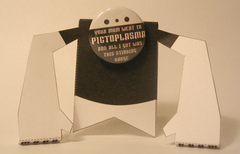 Here's a look at Phoneticontrol's Galactic Bat -- a custom version of Shin Tanaka's Spiky Baby Paper Toy. Galactic Bat brings a slightly quirky down-trodden cosmic touch to the world of Spiky Baby. Pretty sure this is the first paper custom we've featured before on the 'pulse. Shin's ingenious distribution and collabo approach is taking paper toys up several notches. Hopefully Galactic Bat will make into an upcoming Spiky Baby Series. Paper Toy wizard Shin Tanaka's newest paper figure, T-Boy Hoody, builds on his T-Boy character by adding a fashion element into the mix. Accessories for paper figures -- right on ;-) If you'd like to take your shot at customizing T-Boy Hoody drop Shin some email with your request and a little bit of information about yourself. While your'e visiting Shin's site, be sure to check out the growing collection of custom designs submitted from all over the world. From the mad genious behind the Brickboy paper toy, Sjors Trimbach, comes his latest creation -- the Badger. 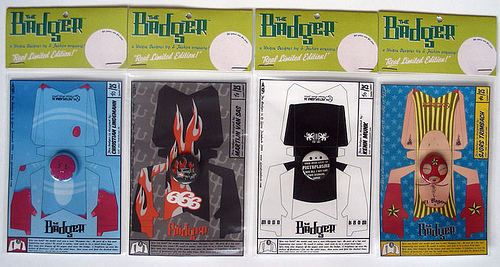 The Badger is a hybrid of two low cost designer goods -- a paper toy and a badge doubling as the face. The first series will be released at the upcoming Pictoplasma Conference (10.11 - 10.14) in Berlin and features four designs (each limited to 25 pieces) from Kenn Munk, Christian Lindemann, Martijn van Sas, and Sjors Trimbach. How do you get one of these quirky collectibles? 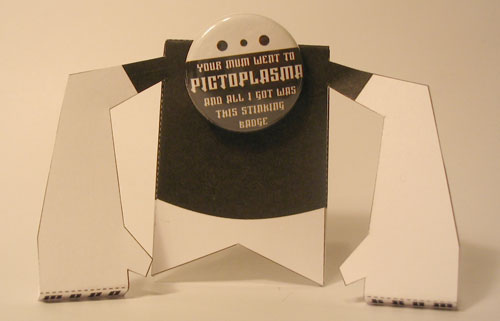 Easy: go to the Pictoplasma conference and buy it directly from Sjors. Fun: win a full set in the HOW BAD IS THE BADGER?! contest! The person who best describes "how much crap this new thing is wins a full set of all 4 designs". Go wild, get personal, insult, curse and freak out. How bad can you get? HOW BAD IS THE BADGER?! Enter now at the Toydigger Forum. Paper toys are cool -- download 'em, print 'em, build 'em -- all for free. And... the template's right there for customizing. 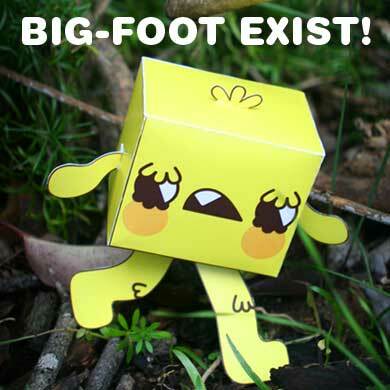 Paul Shih has created a new one to add to your collection -- Big-Foot. Paul would love to have people build 'em and send him photos of their creations. Get it here.